Fine instant gluten-free Gravy Granules for Meat Dishes KNORR Gravy Granules are a range of savoury gravies in a convenient granule format. Use them either as a base to build your own gluten free gravy or as a finished sauce. 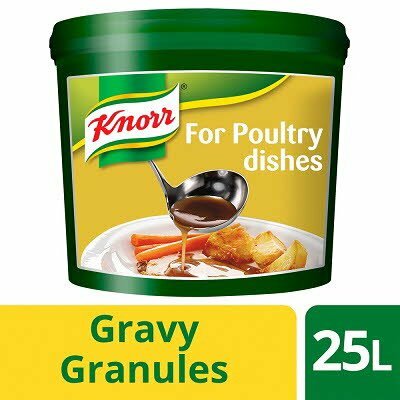 KNORR Gravy Granules allow you to make a gravy instantly by adding boiling water and whisking for 30 seconds or adding it to your roast pan juices. Also available in a case of 4 x 17.5 ltr as well as for Poultry dishes. Maltodextrin, Potato starch, Flavourings, Rice flour, Salt, Yeast extract, Vegetable oils, Tomato puree powder, Dried caramel syrup, Onion concentate, Herbs (rosemary, sage) Pepper, Vegetable fat.